Based on the “pendingrenewalordeletion” email address, it looks like this is an expiry domain name rather than a private listing. The NameJet auction page also confirms that this is an expiry channel listing rather than a privately owned “Direct Lister” listing. The high bid is listed at $69, and there is one bidder for this auction at the time of publication. I believe people can place the $69 minimum bid to observe the auction, but if it ends at below the $900 minimum bid, the domain name will not sell. I am not sure whether the registrar partner has the ability to lower the minimum bid before or during the auction, so may be possible that the minimum bid price is lowered based on the interest in the domain name. 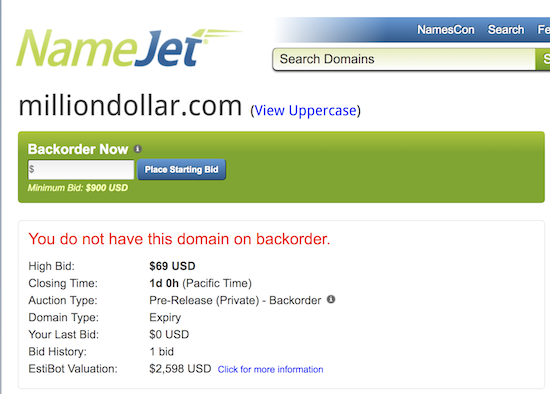 I have seen minimum bids higher than the standard $69 starting price, but I don’t recall seeing one so high on NameJet before. MillionDollar.com is a nice domain name, but it remains to be seen if anyone will pull the trigger and bid $900+ to have a chance to win it. Not the highest starting price I’ve seen on NJ for an expiring name. Register.com would do this? Insane! Oh, that’s right, they are owned by Web.com Group. That explains it. Could I cut out the auction process and just buy it for the Estibot valuation? !